so that as he matures, he won’t tire of the colour scheme or accents. In other words, a room for him to grow up. 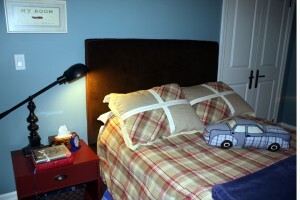 I chose to compliment the blue wall with chocolate brown and deep red accents. I don’t know what planet I was living on when I decided I would sew the curtains for the bedroom, but it spawned the entire design scheme for the room. 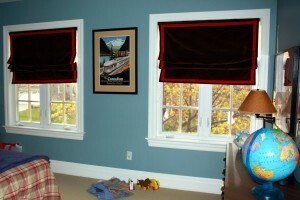 Furthermore, I had never sewn roman blinds. 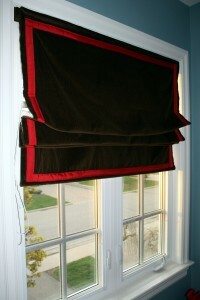 After endless hours of toil (and much cursing), I produced two serviceable blinds made of chocolate brown corduroy with a red grosgrain ribbon trim. I had my upholsterer make a headboard with the remaining material (it cost me $300) and my neighbour found a coordinating bed skirt for $7!!! Other than the bed, which we bought new, the furniture were both pieces that my husband had as a child, which he reinvented by removing the brass hardware and details. With a fresh coat of paint and new hardware, the nighttable and dresser got a second lease on life. The artwork over the dresser is a homage to my father-in-law. As a boy he collected penants with his brother, which he displayed at the family cottage. 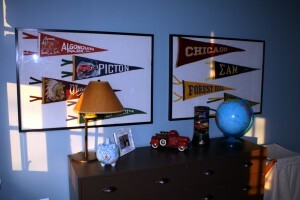 When the cottage was sold, we took the penants and I created homemade artwork from some of them, including those of my father-in-law’s high school, fraternity and camp. I imagine my son will tire of the dÃ©cor one day and ask to paint it black or scrawl graffiti across the walls, but in the meantime I hope the images and colours and even the history of the pieces in his room spark his imagination and bring him comfort when he lays down to sleep each night and awakens each morning. Cleaning a house can be gratifying for me in many ways; it gives me a sense of accomplishment, order and well, cleanliness. So for the last couple of days I have been on a cleaning rampage doing the daily chores of dishes, laundry, sweeping and even tidying up the garden. I even did some dusting, but that’s where the rampage got derailed. 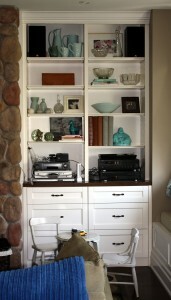 The built-in shelves in our family room are home to AV equipment, photo albums along with numerous tchachkas that I’ve acquired either from family members or various shopping expeditions. As I began to eradicate the perfect circles and lines of dust left behind by a bowl or book, I decided it was time to redecorate. 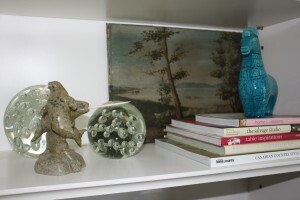 Truth be told, I got my inspiration from Nate Berkus, who had recently been on Oprah and suggested going “shopping” in your home and move your favourite objects from room to room to create newly decorated spaces without spending a dime. 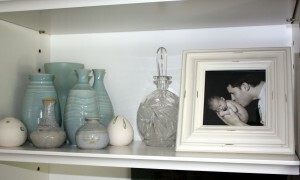 So I took this sentiment to heart and began poking around the house, moving things from place to place until I had created a new vignette on my shelves.I stuck with my colour palette of celadon (which is watery bluey-green) and threw in some glass and crystal pieces along with some wood to warm it all up. I tried stacking books and even putting some artwork at the back of the shelves. The one of the top shelf was painted by my mother. The oil on the bottom left belonged to my father’s parents. My husband made me the wood box that’s sitting on the upper left shelf. 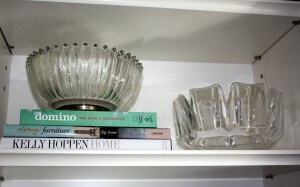 The glass bowl on the books belonged to my mother’s parents and the other glass bowls were wedding gifts. 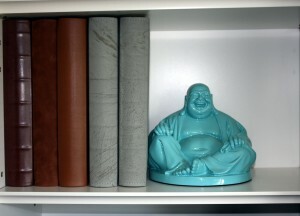 There really is an art to “dressing” shelves, and I’m no pro, but I think my first attempt was not half bad. If you’ve got any advice on what to add, take away or change, by all means I value all opinions.